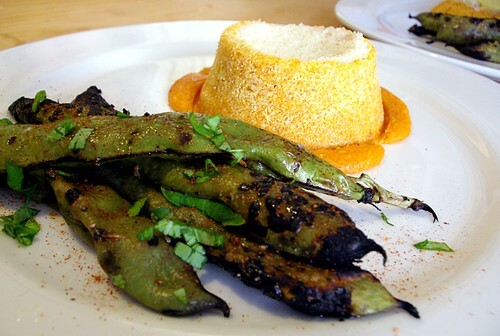 spicy grilled lime and basil fava beans with a crusted savory polenta lava cake, originally uploaded by aarn! +15th July, 2009+. lightly sauteed 1/4c. finely diced home cured pork belly in 1T. olive oil until the fat rendered and the meat was lightly browned. added two cloves of crushed garlic, a little salt, fresh cracked pepper, and a bay leaf, simmered for a bit, then poured in 1 3/4c. boiling water, and a 1/4c. can of tomato sauce. brought the liquid to a rolling boil, then added 1/2c. dried polenta, whisking continuously until thick, then stirred in 1/4c. Grated dubliner cheddar and 1/4c. grated parmesan cheese. prepped two ramekins by spraying them with canola oil, dusting the oiled insides with cornmeal, and adding a base layer of pankos which had been tossed in some dry mustard powder and salt. the hot polenta was then poured into the ramekins, allowed to cool for 15-minutes, and then transferred onto a plate, upside down, still in the ramekins until ready to serve (at which point the ramekins were pulled off, leaving a mold of polenta crusted with seasoned pankos and cornmeal, with a gooey polenta center). tossed some fava beans in a few cloves of crushed garlic, olive oil, salt and pepper, then placed on a hot grill, about 5-minutes per side, until nicely charred. plated the beans topped with a squeeze of lime juice, a dash of cayenne and some ribbons of fresh basil. and to think, i have never really known WHAT to do with the fava..